The fourth round of the English Premier league begins with a derby match between the teams expected to finish in the second half of the table. 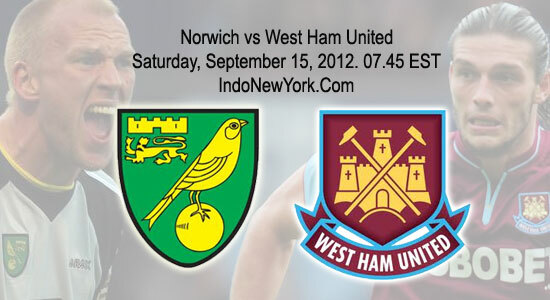 Norwich hosts the match with West Ham United which will certainly be important when the time for deciding who will fight for survival in the Premier League comes. Both teams are candidates for relegation, although the guests from West Ham are currently in the seventh place in the standings. Two wins at home against Aston Villa and Fulham put West Ham in the top half of the table. The team conceded a lost by 0-3 of Swansea as a guest. The hosts from Norwich have two draws in their account against QPR at home and away to Tottenham and a severe loss from Fulham with 0:5. Surely we can expect an equal match, but let’s see who prevails. If we look at the team of West Ham and mostly on their last match with Fulham we would see that Andy Carroll was the one who made the difference in the match. Even the fact he didn’t scored a goal, he participated in all the action in front of guests net and contributed to all three goals in the match. After his substitute because of injury, West Ham’s attack was much weakened and no more goals were scored. The bad news for the manager of West Ham – Sam Allardyce is that Carroll will not be able to take part in this game. This will surely weaken the attack of the team, even more Allardyce likes to play with high balls to a powerful striker as Andy Carroll. Norwich City’s new manager Chris Hughton is a highly experienced professional. As an assistant coach, he was next to some of the biggest names in the Premier League. He certainly knows what it takes for his team to improve their game. Currently Norwich created chances, but failed to implement them. In their first match at home, the team created 11 goals attempts to score, but succeeded just once in front of the QPR’s net. However, Norwich received a goal for the 1-1 draw by only five goal attempts from their opponents. So, we have a match with two equal opponents, who are led by managers with great experience in the league. All this suggests to me that the basic idea of both teams will be not to lose the match and therefore a draw seems to me as the best possible bet for this match. The odds for a draw in this match are 3.3 and this will be my bet. Hello, my name is Nove Zikura and I am a bettor from Serbia. All I do for living is betting. I started many years ago and managed to do what now brings me success. By my betting predictions I have succeeded to spare some money and in 2004 I opened my betting bar - Nove. I'll be happy if you join my guests and we watch, discuss and bet on football. By coming to my place you will find many others like you - people who love betting and people who want to make money from it. Find us on the map below. For these who can't come to Belgrade to visit me personally, you can be my readers on this site.